USB Type-C, or USB-C, is a new USB connector shape that both older and newer USB standards can adopt. This means that the USB 2.0 and USB 3.2 standards can all use the USB Type-C connector shape. The new shape allows you to connect from either side, unlike other USB types such as USB-A and USB-B. USB-C can also support USB Power Delivery and DisplayPort Alternate Mode. 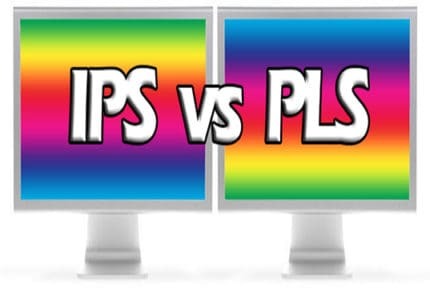 Initially, when USB 3.1 was introduced, USB-IF (USB Implementers Forum) changed the name of USB 3.0 to USB 3.1 Gen 1 while the new ‘USB 3.1’ was dubbed USB 3.1 Gen 2. In March 2019, USB-IF announced USB 3.2 and again changed the naming structure. USB 3.0 is now USB 3.2 Gen 1, USB 3.1 is USB 3.2 Gen 2, and USB 3.2 is USB 3.2 Gen 2×2. Note that only the USB-C connector can utilize the USB 3.2 Gen 2×2 standard. 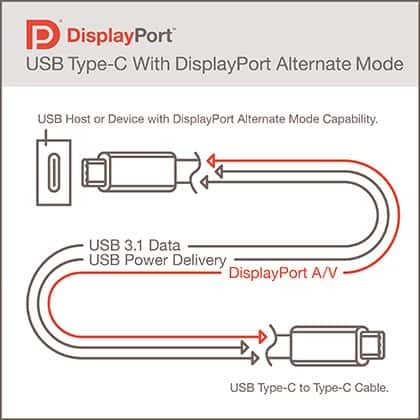 USB-C can also transfer audio/video signal if your device supports DisplayPort Alternate Mode. Additionally, it can charge a device if it supports USB PD (Power Delivery) up to 100W (depending on the device). 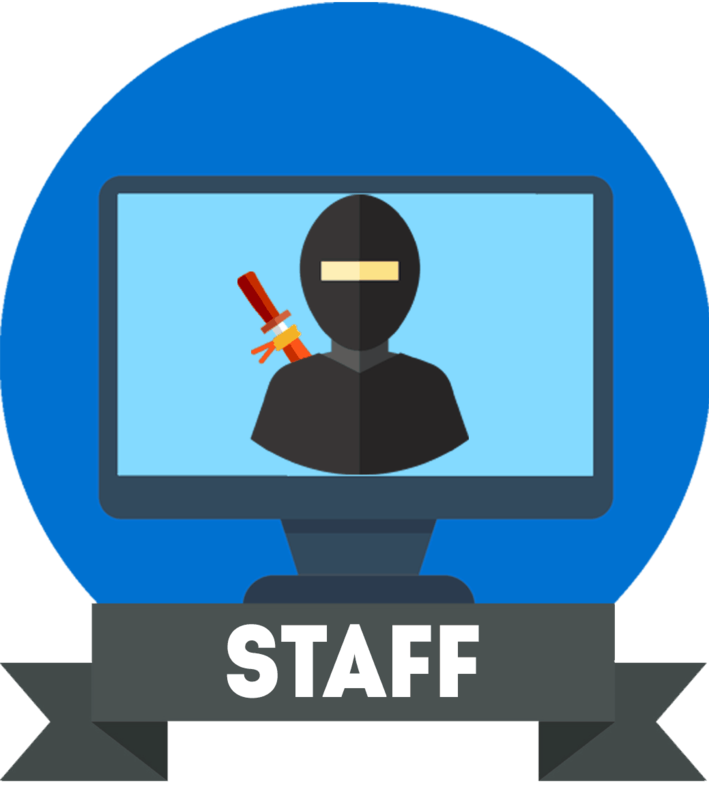 We have a dedicated guide with the best USB-C monitors with power delivery ranging from 60w up to 95W. 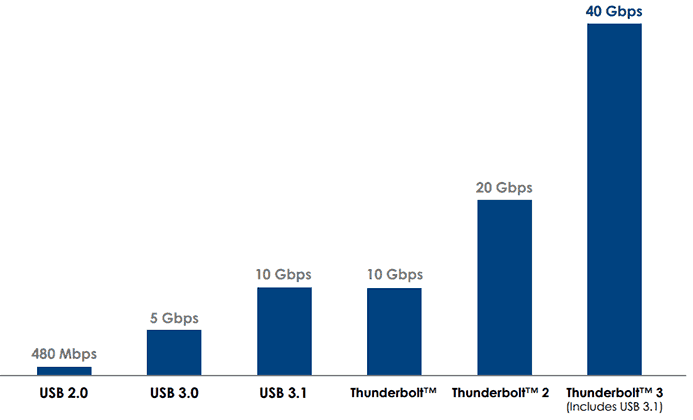 Thunderbolt 3 controller shares the same connector type as USB-C but offers up to 40Gbps of data transfer (with short active cables) or 20Gbps (with long passive cables). It also supports DisplayPort Alternate Mode and Power Delivery up to 100W. USB-IF also announced the ‘USB4’ specification which is based on the Thunderbolt protocol. Just like Thunderbolt 3, it uses the USB-C connector, has data transfer speed up to 40Gbps, and it will support display interface and power delivery. Further, it is backward-compatible with USB 2.0, USB 3.2, and Thunderbolt 3. 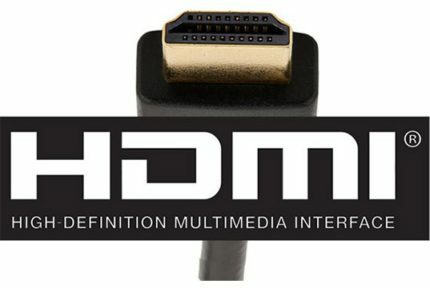 More information about USB4 will be available by mid-2019. Unlike Thunderbolt 3, USB4 will be royalty-free, so it will be more widespread and cheaper than the Thunderbolt 3 devices. Both USB-A and USB-B connectors are quite large which was a problem for devices such as slim smartphones, console controllers, digital cameras and so on. This led to the creation of other shapes of the USB connector, such as micro-USB and mini-USB. As you can see in the picture below, a USB-C connector resembles a micro-USB though it is more rounded and more importantly, it can plug in the device facing either way. Since USB-C is backward compatible, you can still connect your micro-USB and other USB devices to the USB-C port using a fitting adapter.